Rain was starting to come down as the closing women’s track and field event of the 1948 Summer Olympics was coming to an end. To that point, no American woman had taken the gold medal in any of the competitions. Alice Coachman changed that by soaring an unprecedented 5 feet, 6 1/8 inches in the high jump at the London Games. She also jumped into the history books as the first black woman to win an Olympic gold medal. The Albany State (Georgia) College student surpassed the Olympic record of 5 feet, 4 3/4 inches held jointly by Americans Jean Shiley and Babe Didrikson since the 1932 Olympics. Close to 82,000 spectators watched Coachman’s Aug. 7, 1948, victory that came in dramatic fashion as she competed against Dorothy Tyler of Great Britain. Both women jumped the same height, but the American was given the nod because Tyler had several misses at lower heights. King George VI presented Coachman with her gold medal. When the Albany, Georgia, native returned home, a parade was thrown in honor of her historic achievement at the XIV Olympiad. 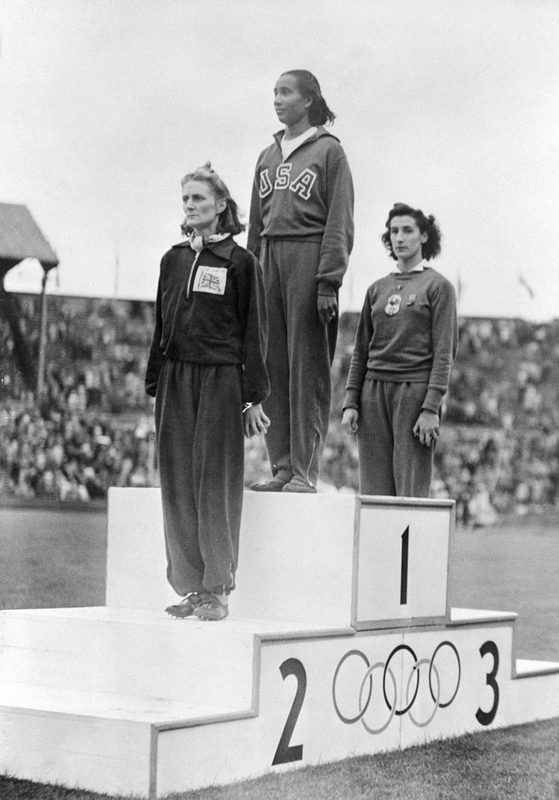 Gold medalist Alice Coachman of the United States (center) along with runner-up Dorothy Tyler of Great Britain (left) and third-place Micheline Ostermeyer of France stand on a podium at Wembley Stadium in London to receive their awards for the Olympic women’s high jump in 1948. In four years as an undergrad at the Tuskegee Institute, Coachman won 23 gold, four silver and two bronze medals competing in the Amateur Athletic Union of the United States. After she competed in the National AAU track and field events, her medal count increased to 26 gold, six silver and two bronze. Coachman’s first national title came a decade earlier when she took first place in Waterbury, Connecticut, at the 1939 National AAU tournament. As a 14-year-old, she soared 5 feet, 2 inches to win the gold. Earlier in the summer of 1948, she set a record for Americans by jumping 5 feet, 4 13/16 inches in Grand Rapids, Michigan. She set the American AAU record for the 50-meter dash at that same competition, making it across the finish line in 6.4 seconds. On July 12, 1948, in Providence, Rhode Island, Coachman hit the same high jump mark but didn’t exceed her Michigan record because night fell on the Olympic trials. The walk to the podium after Coachman won the Olympic high jump stood out to the 24-year-old as the realization of what she had done finally began to sink in. Coachman’s victory was celebrated with invitations to come aboard a British royal yacht and from President Harry S. Truman, who congratulated her at the White House. But racism and the status quo didn’t take a break on the day of Coachman’s parade and celebration in her hometown. Blacks and whites were not allowed to sit next to each other in the Albany city auditorium, and while the mayor sat on the same stage with Coachman, he refused to shake her hand, and she exited through a side door at the conclusion of the event. The 1940 and 1944 Olympics were canceled because of World War II, so when Coachman completed her final try in the high jump, that was the end of her track and field career. The following year, she graduated from Albany State College with her degree in home economics and a minor in science. Coachman became a teacher and continued her work of giving back to those in financial need by creating the Alice Coachman Track and Field Foundation. In 2004, the United States Olympic Hall of Fame inducted Coachman, while the National Track and Field Hall of Fame had done so 29 years earlier in 1975. Following Coachman’s success, the United States saw African-American women such as Wilma Rudolph, Evelyn Ashford, Florence Griffith Joyner and Jackie Joyner-Kersee take over the U.S. track and field program and dominate the sport.